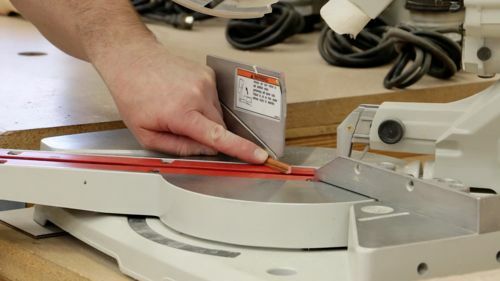 In this video I share how I cut small parts on the miter saw. I am sure this one will be cause for active commentary from the safety police and maybe the hand tool junkies for not using a fancy hand saw to cut small pieces. Well, this is the way I do it in the American Craftsman Workshop. Because if the tool doesn’t make any noise and throw a rooster tail of sawdust, how am I supposed to know that any work is getting done? Remember to let your work be your signature. Nice video Todd…good information and well presented! bear – Thanks man! I did that all in one shot with no script or outline. It just flowed out, I could hardly believe it since most do not go like that. Great video, Todd. I’ll be sure to try this technique. I know my kapex has a depth of cut feature that will be useful to keep me from cutting my fence in half accidentally. Great video, Todd—thanks for sharing! I still think some kind of indexing system would make it quicker and easier to line up the kerfs. But then again, if the ZCI’s are disposable, it doesn’t matter if the kerf gets enlarged over time. Dean – As the kerfs become enlarged, I will cut new ones. On some of the ZCI’s they end up with several kerfs in them. Sometimes the cut needs to be prioritized on the left of the kerf, and sometimes on the right. So it is inevitable that it will happen. As a contractor, simple, effective, and fast is best. Basically, the need to make money distills everything down to doing just what needs to be done and nothing more. Yes, your intro SCARED me! Joe – sleds on the table saw can work great. I don’t go that route because in the shop my miter saw is next to the assembly table. I would have to walk 50 feet total to the table saw and back or move my assembly area to the table saw. My other situation is using the same setup on the job site. It just works better using the miter saw than the table saw on the job site. ... and disadvantages of a small shop! 1. I do not have a power miter saw. 3. I don’t go to job sites. 4. The sleds have been made… & in use for awhile. 5. I would probably have to move 1/2 of my shop stuff around, & to the driveway, to get to it, if I had the room for it. ... then, put it all back when done for the day. Thanks for watching Roger! Hope all is well. Nice job on the video, Todd. Thanks for this info! Very informative and clear. BB1 Thanks for the positive feedback! I am working on more!